What Mother doesn't love flowers? I know mine does. 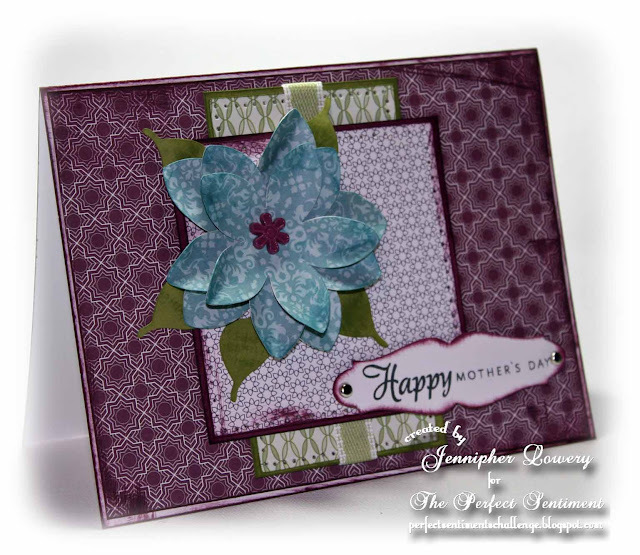 This week at The Perfect Sentiment we are challenging you to create a card with a Mother's Day sentiment and include some handmade flowers. You can use your punches, dies, Cricut cartridges. You can hand cut them from fabric or felt. You can even crochet them. Whatever you fancy. Just no premade flowers. We are being sponsored by Robyn's Fetish Digital Stamps and More. Our random winner will receive 5 digital stamps of their choice from Robyn's Fetish. I decided to break out my Mother's Day Bouquet Cricut Cartridge for this challenge. It's appropriately named, wouldn't you say? I've had this cartridge since last year and have never used it. I used Flower #25 cut three times in three sizes one quarter inch apart. I inked the edges of the petals slightly and rolled and shaped them until they looked a little more realistic. The leaves are also from the Mother's Day Bouquet Cartridge. All the paper used here is from Stampin' Up! ®. I used Pocket Full of Posies DSP, Rich Razzleberry and Pear Pizaaz CS, as well as Pear Pizaaz ribbon. Beautifully done! The colors are nice and rich, and I love the flower. So glad you joined us at UIT! So pretty! The flower is lovely. I love the rich colors you used. Beautiful! Love the colors and that DP too. WOW, Jennipher! Love that color palette. What gorgeous papers you chose. The flower is exquisite. wow love it jennipher very nice. Awesome card - I love all the patterns and how they work together on this one! This is just so pretty! Beautiful colors. fabulous mix of patterns jennipher What a fabulous card I love this one , great colours and that flower is super well done. Such a beautiful, classy card. The purple and green go so well together, and all of the dp work wonderfully. That flower is simply fabulous! Such a gorgeous creation Jenn. I love that flower and the colors and papers you used. I wonder if I have that paper. Great job. love the cardstock. SU has some beautiful stuff. I wouldn't have thought about combining blue & purple-I think it's great! Stunning, Jenn! I want a duplicate! Love the papers, the flower, the she-bang! Beautiful design and colors. Love the patterns. Love the patterns and colors on your beautiful card! Gorgeous! Love the papers, the piercing, the flower... all of it!